Tuesday, December 5, marks the 50-year anniversary of what was to that date the largest anti-war protest on the UI campus. Over 200 demonstrators gathered outside the Iowa Memorial to protest the presence of Dow Chemical representatives who were on campus to interview prospective employees. 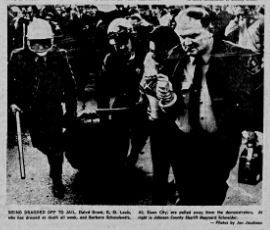 There were 18 arrests and the day’s events ushered in a new era of protest, both locally and nationally. Less than four months later, President Lyndon B. Johnson, citing eroding public support for his administration’s policy on Vietnam, announced he would not seek re-election to another term. 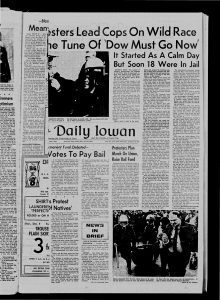 Go here (http://dailyiowan.lib.uiowa.edu/DI/1967/di1967-12-06.pdf) for the Daily Iowan’s account of that day. 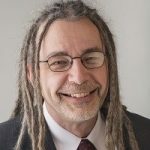 University Archivist David McCartney presented on “Documenting Activism: How the Digital Humanities Can Uncover the History of Protest” at the American Association of University Professors national conference meeting in Washington, D.C., on June 16. McCartney, who curated the online exhibit “Uptight and Laid-back: Iowa City in the 1960s,” launched in 2016, described how the web site is used as a discovery tool for UI faculty and other scholars from a range of disciplines, including history, rhetoric, journalism, and English. The exhibit is a collaborative project of the Dept. of Special Collections, the Digital Scholarship and Publishing Studio, and members of the UI community. It features content documenting civil rights activism, the anti-war movement, and other political movements of the era. He co-presented with Stetson University Assistant Dean for Student Affairs/Deputy Title IX Coordinator Tammy Briant, who teaches the course, “Law and the Civil Rights Movement.” The course includes a road trip to several cities in the South each summer where students have an opportunity to meet personally with veterans of the Civil Rights Movement. Her presentation reviewed lessons of the Civil Rights Movement and how they might be applied to current campus advocacy. The conference included presentations about the First Amendment on campus, the right to protest, academic freedom, and supporting students from diverse backgrounds. This year’s meeting commemorated the 50-year anniversary of adoption of the AAUP Joint Statement of Rights and Freedoms of Students. CBS Fox 2: Brinton Extravaganza Will Celebrate Silent Film Collection by Steffi Lee. How I Teach by Dr. Adam Hooks, English Department, University of Iowa. 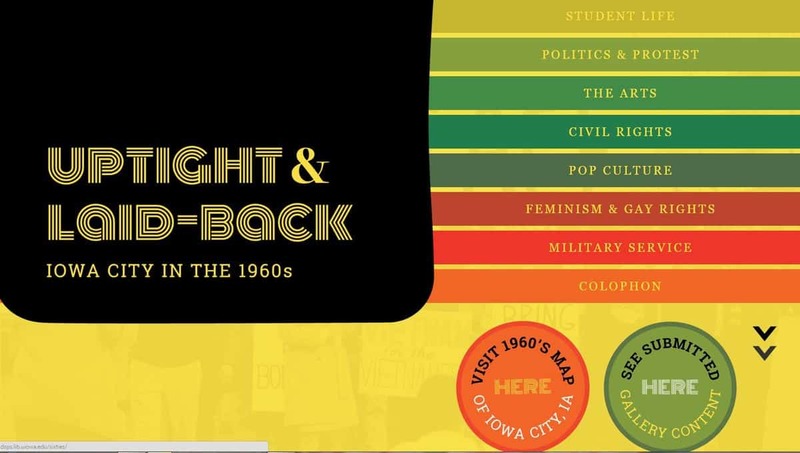 Uptight & Laid-back: Iowa City in the 1960s, an ongoing collaborative project developed by University Archivist David McCartney and The Digital Scholarship & Publishing Studio, brings to life a dynamic and turbulent decade for the University and for Iowa City. The curated topics pages and interactive map invite the public to explore an array of material associated with the campus and the community. The public is also welcome to contribute materials! We’ll be adding to the site over the coming months. Stay tuned! The Olson Graduate Research Assistant position in Special Collections is a two year 50% position for incoming or current graduate students at the University of Iowa to join the department and support reference, instruction, outreach, processing, and exhibitions, while having opportunity pursue individual projects. Seminars are 90-minute sessions, given in a variety of formats. 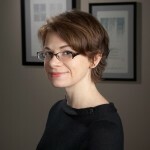 They constitute an important educational component of each conference and are a valuable forum for the exchange of ideas and information on particular topics of relevance to rare book and manuscript librarians. Read more. This finals season we challenge you to find time for breaks in your studying. To help, librarians at Main Library have set up a handful of challenge activities designed to help take your minds off of finals, just for a bit. 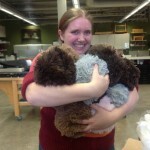 Special Collections staff will be on hand with fur fabric and supplies if you want to become a tribble maker and add to the Star Trek exhibition! Get an “I’m a tribble maker” button and an entry to win the life size Captain Kirk cutout currently in the front case of the gallery. More info. 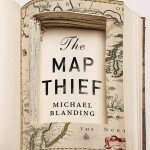 The Friends of the University of Iowa Libraries will host Michael Blanding, author of bestseller The Map Thief, the gripping story of an esteemed rare-map dealer who made millions stealing priceless maps. Thursday, May 5, 2016 in the Main Library’s Shambaugh Auditorium. Blanding’s presentation will begin at 6:30 p.m., with a reception and book signing to follow at 7:30 p.m. This event is free and open to the public. More info. Wednesday, May 11th, Snacks at 6:30pm, Discussion from 7-8pm in the Special Collections Reading Room, 3rd Floor Main Library. Find a copy of “The Millionaire and the Bard: Henry Folger’s Obsessive Hunt for Shakespeare’s First Folio” and join us for a book club. Music performances featuring Tom Mason and Homebrewed. This week we had ten classes in to special collections. Just because it’s close to the end of the semester doesn’t mean we’re slowing down! While you may be more focused on ending the academic year strong, if you are an instructor, this is the right time to start thinking about requesting class dates and times for summer or fall 2016. Please use our instruction request form to request your upcoming sessions: http://www.lib.uiowa.edu/forms/speccoll_class/. It’s especially important to be the early bird if you work with early materials, as our medieval manuscripts are limited to five class uses per semester on a first come-first serve basis. Also note that Instruction Librarian Amy Chen will be out on vacation for three weeks from May 9 through May 27. During this time, the instruction request form will be forwarded to the Olson Graduate Assistants, John Fifield and Kelly Grogg. They will handle the booking of your courses until Amy returns. Other questions or correspondence to Amy will be answered as soon as possible upon her return to the office at the end of May. Subscribe to our YouTube channel and never miss a video!